Mars’ foremost photographers pick their favorite images of their favorite planet. Asked to nominate one place as Mars’ branch office on Earth, you could come up with a short list of candidates: NASA’s Jet Propulsion Laboratory in California, where most Martian spacecraft are built; the University of Arizona, which just ran the Phoenix lander mission from its Tucson campus; Ray Bradbury’s house. Less well known, but every bit as Mars-centric, is the San Diego headquarters of Malin Space Science Systems, where planetary scientist Mike Malin and his colleagues build instruments for exploring the Red Planet. Most of the spacecraft sent to Mars in the past decade have had one of the company’s cameras on board, and the number of images added to NASA’s archive as a result has reached well over 260,000. We asked Malin and his colleagues to pick some of their favorites, which you can browse in the gallery at right. 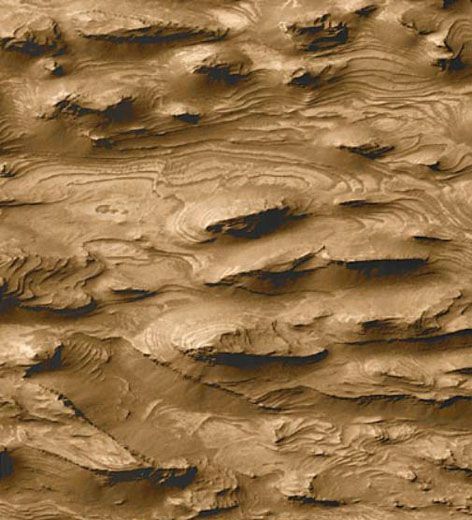 Among them is this widely reproduced image of layered outcrops in West Candor, one of the canyons of Valles Marineris. Taken in 1999, early in the primary mission of the Mars Global Surveyor, the photo above was one of the first to show hundreds of layers in the canyon, suggesting a more complex geological history than scientists had expected. Just one of the many surprises and delights from the Malin collection. 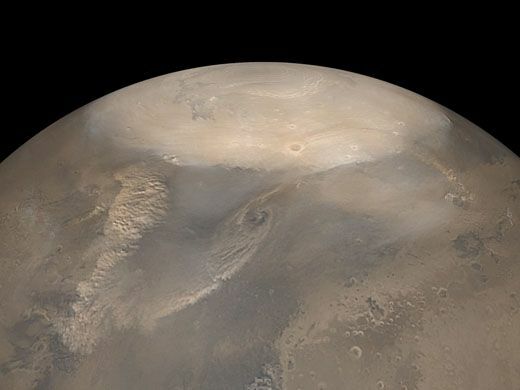 This mosaic of wide angle images from the Mars Observer Camera (MOC) on NASA's Mars Global Surveyor (MGS) spacecraft was taken on May 24, 2002. The picture shows the planet's north pole in springtime, with dust storms visible near the edge of the polar cap. The heat differential between this cold ice cap and the warmer rocks to the south create winds that kick up dust storms each northern spring.